It’s a strange fact that most creatures seem to know, either by instinct, habit or reasoning, that regular inbreeding does not make for a strong population. Given availability and opportunity, populations will find a way to mix genetic lines and thus keep their species healthy and adaptable. Where this is not possible, a species might still survive, but will be much vulnerable to disease and changes in habitat or food supply. Cheetahs (Acinonyx jubatus) are a good example: due to climate changes over 10,000 years ago, the cheetah population was severely diminished. The existing species (the only extant survivors of the Acinonyx genus, which used to roam Europe as well as Africa and Asia) is well adapted to its environment, but with all members sharing 99% of their genes, a single fatal virus could wipe out any exposed individuals instead of just the susceptible ones. 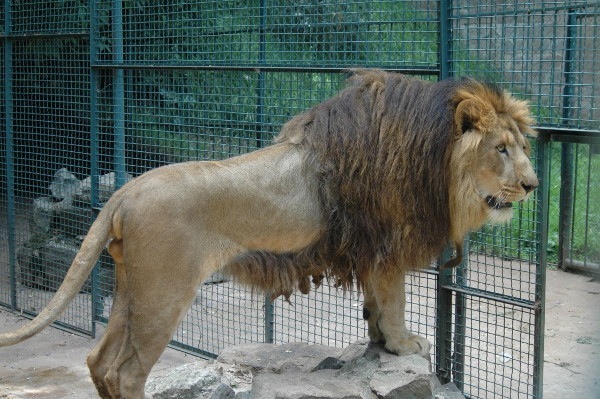 So what to say about the 16 lions found in the decrepit Addis Ababa animal park. They are the descendants of seven forest-dwelling lions collected at the zoo’s founding in 1948 by the emperor of Ethiopia. There is a long, sad backstory to the zoo’s abysmal conditions, the lack of funding, the careful avoidance of inbreeding only to have cubs die due to lack of proper care. The mayor of Addis Ababa reached out to sister city’s officials in Leipzig, Germany for help, and received it the form of Leipzig Zoo veterinarians. The lions were identified as being genetically unique, which is to say they have several unique traits while still belonging to the species Panthera leo. There are few wild lions left in Ethiopia, and all lions are considered endangered. Conservation efforts are underway for the Addis Ababa lions, both in terms of living conditions and possible further breeding. These pitiable creatures have spent their lives in tiny concrete and steel cells, fed a spare diet more suited to house cats, their bodies sold to taxidermists to raise money for the zoo. Awful. And yet – would this genetically specific group have survived in any fashion in the wild during the decades when all their tens of thousands of relatives were wiped out? Kept in a concrete bell jar, this tiny population has limped along, a hidden treasure of genetic information that can now be (hopefully) rescued for the overall genetic diversity of lions as a whole. Most likely all those lions will be captive as well. I keep thinking there must be a silver lining here somewhere, I just can’t seem to define its outlines.